Long Spiked Butterfly Bush is a tall shrubs or small trees, 1-6 m tall, native to China, Bangladesh, India, Thailand and Vietnam. Stems are noticeably winged, square, brown striped and exfoliating. Leaves are nearly stalkless - leaf blade narrowly to very narrowly elliptic, 4-45 X 1-15 cm. Leaf margin is crenate-serrate, and tip sharp. Mature leaves are dark green and very large up to 10 inches in length at maturity. Dense flower spikes occur at the end of branches. Compared to the more common Butterfly Bush, they are long, 5-20 X 2.5-4 cm. Flowers are small, cream colored, with an orange-red throat. The four petals are sort of roundish in shape. 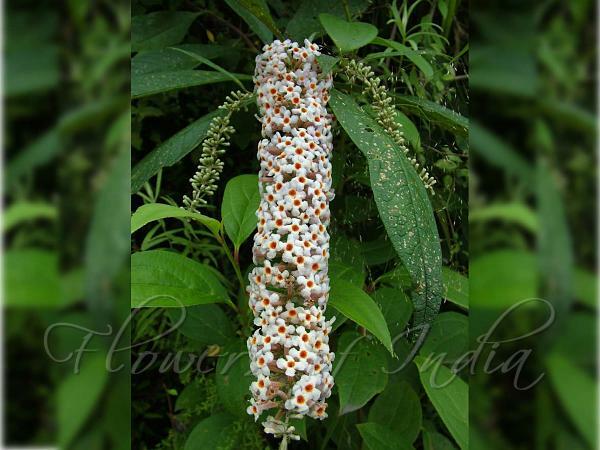 Long Spiked Butterfly Bush is found on mountain slopes, river banks in forests, at altitudes of 900-3200 m.